Amazon now makes it easier for vendors and customers to sell books and other items using its Amazon Seller app for the iPhone, released leased week, and available for free download. The biggest plus with using the features of the mobile app is its product code scanner, including manual product search, which makes it easier to quickly identify items and selling opportunities, and prepare them for sell on Amazon. The app keeps a history of searched items that can also be starred as favorites. The results of items searched on the app include current new and used prices, and forms for seller product information, including price, shipping credits, and other fees. As with the Amazon online merchant tools, the Amazon Seller app contains a list of all your items for sale, and sections for viewing and replying to customer messages. The app makes use of iOS Notifications, as well as providing alerts for suspended accounts and accounts under review, invalid credit cards, and email delivery failures. Amazon Seller, optimized for iPhone 5, requires a US Amazon account, iOS 6.0 or later, and is also compatible with other versions of the iPhone, iPad and iPod touch. Upcoming updates of the app will including inventory and order management, and sales summary—all of which will be powerfully useful for vendors who want grow and manage their business on Amazon. 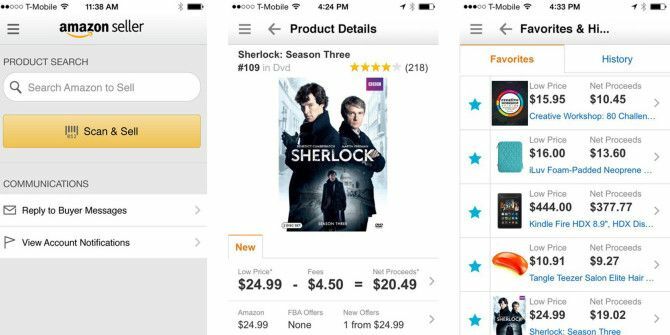 Amazon’s other mobile apps include the Kindle Reader, Amazon Instant Video, Amazon Cloud Player, and the Amazon App for general shopping and purchasing. Seriously? No Android? Where's the love Steve?